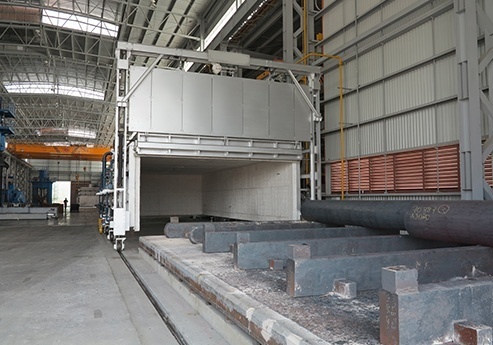 Forge furnace and ovens with the best technology for the following forge plant processes. Most advanced heat reclamation systems savings up to 70 % vs cold air. 10-70%. Designs to comply with AMS2750E and NADCAP standards with temperature tolerances according with class 1. Pulse Firing for better temperatura uniformity and fuel savings. Nutec Bickley provides forging furnaces with the best technology for the stress relieving of steel parts after forging. Outdoors designs available with required steel construction details and NEMA4 or IP65 codes components. Cooling nozzles systems available to accelerate and control the cooling part of the cycles. 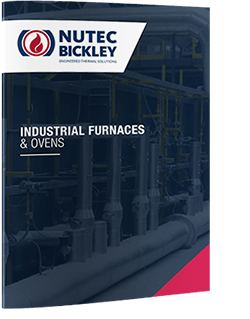 Nutec Bickley provides heat treating furnaces with the best technology for the following processes: Normalizing, Austenitizing, Tempering, Annealing and stress relieving. Most advanced heat recovery systems with recuperative burners or central recuperators. Fiber linned sections using the jointless system. Completely free of joints. Designs to comply with AMS2750 , with temperature tolerances according with category 2 in aerospace applications. High forced convection designs for tempering applications. Nutec Bickley provides preheating units with the best technology to preheat tools for hot assembly, dies of presses and load. Use of external energy source using hot gases from existing forge furnaces. Control system capability to maintain stable operation. And forge furnace (source energy) can be used in normal operation. Nutec Bickley provides batch and continuous units with the best technology to deliver controlled cooling of special alloys parts after forging and final blast cooling. Use of burner system in order to cool with burners “on or off”, depending of the cooling requirements. Controlled Air handling system with air inlets and outlets in order match desired cooling profile during transformation. Final blast air cooling sections for safe parts handling. Nutec Bickley provides continuous units with the best technology for the heating process of steel end bars before forging process. Decrease of steel Decarburization in continuous heaters.